From Monday, Jan. 29, through Wednesday, Jan. 31, the University will host its annual Spring Career Week. Starting with the kickoff of the Syracuse University Career Fair, this week gives students the opportunity to speak one on one with representatives from numerous industries. For many students, these career fairs and receptions offer the first step to finding a job or internship. Students meet with an industry representative at a previous career fair. Employers attending the career fairs and receptions will be on hand to discuss internship and job opportunities, as well as give information on company culture and the type of applicant that fits well with their company. Students are encouraged to bring several copies of their resume and to wear professional dress, if possible, to career fairs. All career fairs are open to all students, regardless of major or class level. 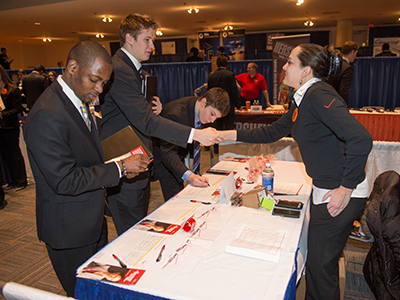 Jan. 31, 10 a.m.-2 p.m.
A complete listing of employers attending each event can be found at orangelink.syr.edu. For questions about the events, students are encouraged to visit Career Services in 235 Schine or call 315.443.3616.